If you can’t arm or disarm the M1 in the app with the quick arm buttons then there could be a few things to check. 1. Make sure the code is a valid code in the panel. Click on Users from the tree on the left in ElkRP. You will now see a list of users, make sure the code is in the list that you where using. 2. 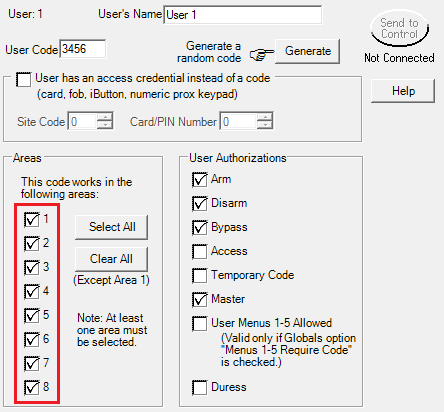 Make sure a the user code you are using does not have Access ticked. 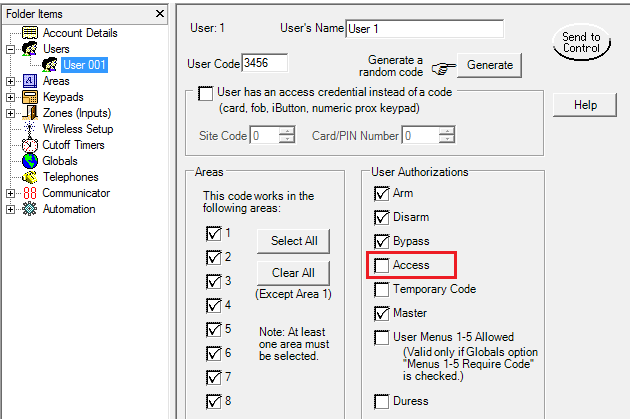 By having Access ticked will not allow the panel to be armed / disarmed using that code. 3. Make sure the user code you are using is allowed in the same area the app has been assigned to. If the user code is not assigned to the area the app is then you may find it will not allow you to arm or disarm that area. 4. See if you can arm and disarm the panel using the same user code using the M1’s Keypad. Need to make sure that this keypad is set to the same area assigned in the app.